Below are ten of many good reasons to buy Vintage Port. Click on each item to learn more. Few wines deliver such richness and depth of flavour as Vintage Port. Whether drunk young for its concentrated fruitiness or for the opulent complexity which develops after years of ageing in the cellar, Vintage Port is always sublimely pleasurable. And in a world where many wines are beginning to taste the same, the character of Vintage Port remains distinctive and unique. 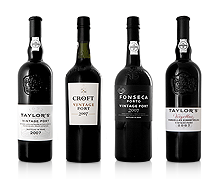 Each of the great classic Port houses has its own particular style – the elegance and restrained power of Taylor, the opulent fruit character of Fonseca and the luscious flavours and exotic aromas of Croft. Moreover, every vintage year produces a wine with its own distinctive personality. Vintage Port’s complexity and richness of flavour derive from a number of factors: The unique soil and climate of the Douro Valley, the wide range of different traditional Port grape varieties, each contributing a particular aromatic dimension to the blend, the inherited skill of the wine makers and blenders and the contribution of the fortifying spirit which, with time, will add its own character to the wine. For at least two centuries, Vintage Port has been recognized as one of the world’s great classic wines. Today, Vintage Port from the best Port houses attracts some of the highest ratings awarded to any wine. A recent survey by Drinks Business magazine identified Taylor’s as having the highest average Parker score of any wine producer in the world, including the top estates of Bordeaux and Burgundy or the iconic vineyards of Tuscany or California. Four of Fonseca’s Vintage Ports have been given a perfect 100-point rating by the Wine Spectator magazine, a distinction shared by only a tiny handful of famous wine producers. As would be expected, Vintage Ports from the famous Port houses are of necessity quite expensive. However they are much more affordable than most iconic wines from other classic wine regions including many which attract lower scores and ratings. Vintage Ports are particularly good value when purchased on release, when special ‘declaration’ prices and conditions apply. Because Vintage Port has an extraordinary capacity to age, it represents a secure investment and will tend to increase in value as it ages, particularly if it has been made by one of the top houses and is from a good year. Opening a bottle of Vintage Port is a wonderful way to mark a special occasion such as a birthday or anniversary. This is particularly the case when the Vintage Port is from the year when the event took place. Vintage Port will also provide a special touch to other celebrations, like the success of a business venture or a personal achievement. Vintage Port makes an exceptional gift, particularly when it is from a year which has a special meaning to the person who receives it. There are superb wines made today in many parts of the world but few have anything approaching the long and fascinating history of Port. Many of the well known Vintage Port producers were founded over three centuries ago, such as Taylor’s which was established in 1692 and Croft which traces its origins back to 1588. Most of them are family owned and several are still run today by descendants of their founders. Vintage Ports are the product of this long heritage and tradition, as well as of inspired wine making and viticulture. The upper Douro Valley in northern Portugal, where Port comes from, is one of the longest established vineyard regions in the world and was the first to be legally demarcated, in 1756. The classification of Port vineyards in 1757 predates that of Bordeaux by almost a century. The ancient terraced vineyards on which many of the finest Port grapes are grown are now classified as World Heritage by UNESCO. Drinking an old Vintage Port can be a magical experience, not only for the pleasure given by the wine itself, but because of the link it represents with the historical events which occurred in the year the wine was made and with one of Europe’s oldest and most fascinating wine making traditions. It is difficult to think of a more enjoyable way to end a meal than with a decanter of Vintage Port. It is the perfect wine to serve when the guests are at their most relaxed and can give the Port, with its sublime flavours and aromas, their full attention. Because Vintage Port is such a complex and multidimensional wine, it is generally enjoyed on its own or sometimes with a simple accompaniment such as a plate of walnuts, dried fruit, or candied orange peel. However a young Vintage Port is also one of the best wines to enjoy with cheese, particularly blue and other ripe fully flavoured cheeses. Many chefs also enjoy pairing Vintage Port with main dishes, such as rich poultry and game recipes, as well as with desserts. Vintage Port is widely regarded as the perfect wine to enjoy with a cigar as its subtle and complex flavours create a magical blend with the delicate aromas of the smoke. No serious wine collection can be said to be complete if it does not contain at least some Vintage Ports from the top Port houses. Vintage Port can be said to be the ultimate collector’s wine. Its ability to age is legendary and it will outlive most other wines in the cellar. This resilience and longevity means that – at least in the case of Vintage Port from a well known house - it will keep its value and indeed appreciate provided it is properly stored. Vintage Port also has another characteristic which is important to any collector: It’s rarity. Vintage Port is only made in the best years and represents a very small proportion of the crop. It is selected from the very finest wines from a handful of famous estates, most of which belong to the Port houses themselves. In the last few decades only about three years in ten have been declared. On average, Vintage Port represents no more than 1% of all Port sold. The amount of Vintage Port bottled by each of the top houses is also relatively small. For example the amount that was bottled of Fonseca Vintage 2007 equates to roughly half the normal production of the grand vin of Château Latour. With the passage of time, a Vintage Port will become progressively rarer as bottles are consumed. The tendency to drink Vintage Port younger means that the wines become rarities much more quickly than they did in the past. The geographic spread of interest in Vintage Port – which for many years has ceased to be concentrated mainly in Britain – also means that the amount of Vintage Port made now has to be spread more thinly with individual allocations being correspondingly smaller. The offer of Vargellas Vinha Velha 2007, admittedly a very rare wine indeed, was fully subscribed by the trade within days of the release being announced. In the past Vintage Port tended to be associated with formal entertaining and with the rarified environment of Michelin-starred restaurants or gentlemen’s clubs. Vintage Port does, of course, still grace such establishments and continues to be regarded as an important ingredient of civilized hospitality. Today, however, people tend to take a much more informal, even irreverent, approach to the enjoyment of fine wines and Vintage Port is no exception. It can be enjoyed at any relaxed gathering of friends, whether or not they are knowledgeable about wine. It is often forgotten that Vintage Port is available in half bottles meaning that it can be enjoyed even if there are only one or two people present – perhaps settling down in front of the fireside with a good book or relaxing after a hard day’s skiing on the slopes. The opening and decanting of a Vintage Port are pleasurable activities and are actually quite simple to carry out. For those who are not interested in discussing the more obscure details of house style or the differences between one harvest and another, Vintage Port can and should be appreciated for what it is: one of the most delicious of all wines. However, for those interested in the culture of wine, Vintage Port is a fascinating subject providing vast opportunities for pleasurable discovery and discussion. There are many traditions associated with Vintage Port. Most can be ignored altogether but there are one or two customs that can enhance the guests’ enjoyment. One tradition is that the decanter of Vintage Port is passed clockwise round the table, never travelling back in the opposite direction. This does not have its roots in any arcane superstition or strange historical event. Neither is there evidence that it makes any difference to the taste of the Vintage Port. It is simply intended to ensure that everyone has a chance to enjoy the wine and no-one gets left out.